Parent portals are primarily a mirror of the student portal. 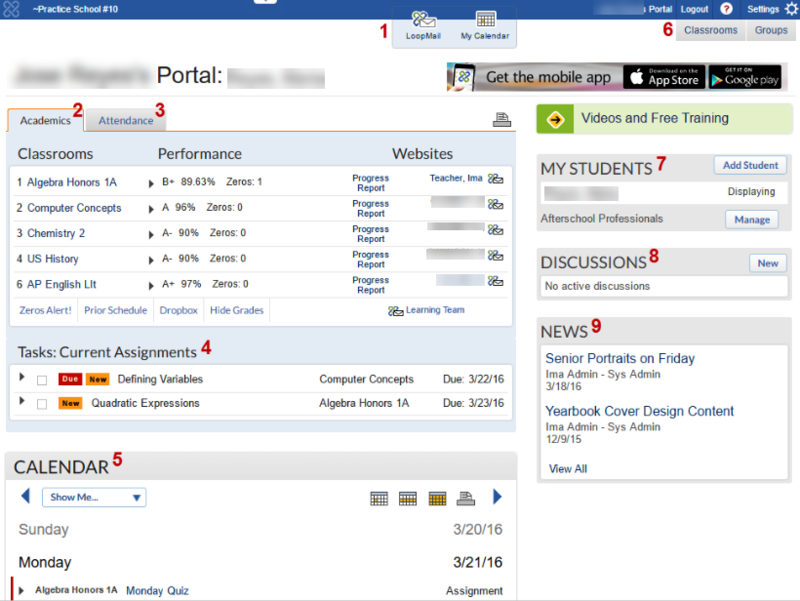 A parent's portal has the same LoopMail, and Calendar icons as all other users of School Loop Plus. There is no Locker or Drop Box icon for the Parent Portal. All of the grades, percentages and number of zeros are located here. If a teacher has not published grades, you will see "No Grades Published". If all classes show "Grades Hidden", then click the Show Grades button in the gray bar. Click the course score for a course to get a detailed view including the 5 most recently graded assignments a list of assignments with a zero, and a grade trend graph. A link to the full progress report is available here as well. There are convenient LoopMail icons next to each teacher name so you can quickly send any teacher a message. Alternately, you may use the Learning Team link below the course list to send a message to any or all teachers and other members of the student's team. Course titles link to the Classroom. Teacher names link to their website if published. Access to the Zeros Alert!, Prior schedule, and Submitted Work are also available below the course list. Note:Depending on how the school has configured the permission settings for School Loop, your parent account may have to be approved to view grades and adding a new student to your account may require that your account be approved again. These setting are in place to protect the privacy of student information. Permission to view student grades is granted by the school administrators and each school establishes its own approval process. Please contact your school for more information. The optional Attendance feature displays a Student's absences and tardies for the current week by period and/or by full day. Click the View All Attendance link to view all attendance data for the school year. The legend is created by school staff and appears on the bottom of the attendance display. This section lists all assignments that are not yet due. Click on an assignment to see more details. Students can check off assignments that have been completed. Every assignment published by the student's teachers appears in the parent's calendar. Other events in the calendar can include events from groups, and school wide events published for parents. The calendar has icons for day, week, and month views. Quick links to view the classroom for each teacher, which contains information such as assignments, classroom news, curricular content, and locker resources, and any group the parent is a member of. A parent account is initially associated with a single student. After creating their account, parents can use the Add Student button to add other students (in the same school) to their account. All of their children on their account are listed in this section of their portal. Clicking the names of their children switches their view to that student's information. This section of the parent portal shows the current replies to discussions in which the parent is participating. All news published for parents appears in this section of their portal. Copyright 2019 School Loop, Inc. All rights reserved.